The DICKOW NKL-Standard pumps acc. to DIN EN 733 are single stage, single flow volute casing pumps of horizontal design, with end suction flange and center-lined vertical discharge flange. The complete bearing bracket, including intermediate casing with shaft sealing and impeller, forms a back-pull-out unit. Outline dimensions and performance range comply with the requirements of DIN EN 733. 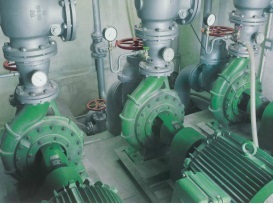 The performance range is subdivided such that the available pump sizes grant best efficiency at all service conditions. Volute casing, flange design. The one-piece volute casing is provided with integrally cast feet for mounting on the base plate. Suction- and discharge flanges are in accordance with DIN 2532 /PN 10 respectively DIN 2533 / PN 16.